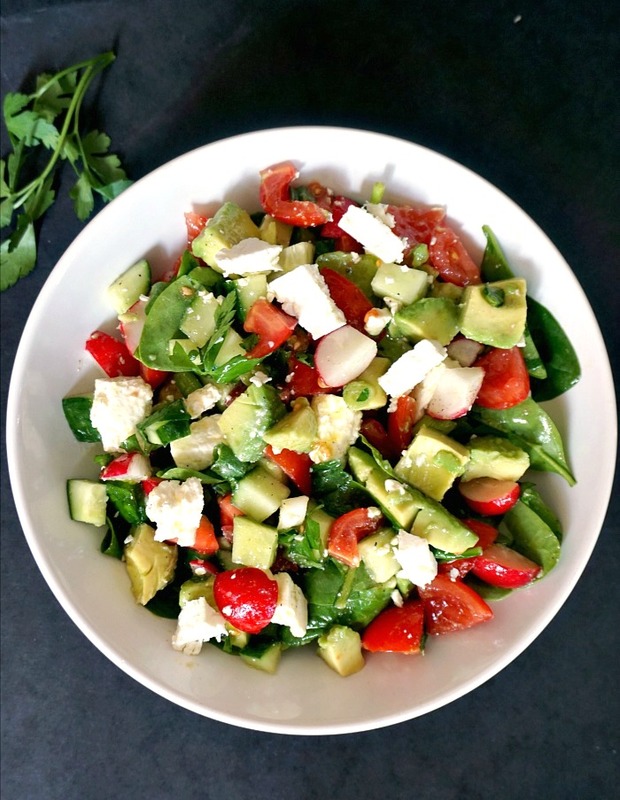 Cucumber Tomato Avocado Feta Salad, healthy, easy to prepare and so delicious. 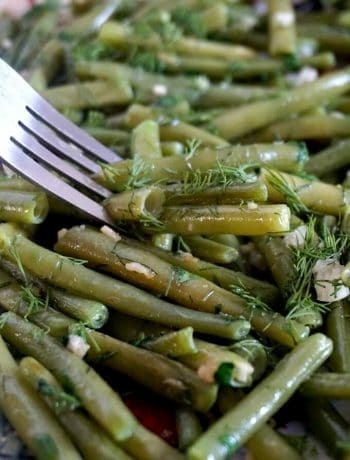 A brilliant recipe to enjoy all summer long, and take full advantage of the fresh vegetables that are in season. Serve it cold from the fridge and relax, you’ve done a great job keeping healthy! Love them or hate them, salads are sheer goodness. If you struggle to get your five a day, well, have a nice bowl of salad, and you’re good to go. I admit l have days when l probably eat not that healthily, but not quite intentionally. In my daily struggle to get my naughty toddler to eat a nutritious and healthy meal, l end up eating whatever l can grab quickly, mainly a boring sandwich or whatever’s in the cupboard or fridge. I know l shouldn’t stress myself so much about what and how much she eats, but it’s pretty disheartening to put so much effort into preparing a meal she just refuses to eat. And usually for no reason whatsoever, or, probably because she decides she doesn’t like the colour or texture or whatever. Toddlers, hey! By the way, if anyone can give me some tips about how to get a toddler to eat healthy stuff, please let me know ? I’m hopping her little sister, who’s only 3 months old, will be a less fussy pants when she reaches the toddler stage. One can only hope, right? So, l have decided that rather than munching on a biscuit or bar of chocolate, l can just get fresh vegetables that l can quickly grab whenever l’m peckish. Or make them into a beautifully healthy salad. Cheese works perfectly here, it makes the salad more filling and adds that bit of saltiness that we need. And the great thing about it, it has the simplest and lightest 2-ingredient dressing ever, olive oil and vinegar. You really need nothing else, since you get so much flavour and freshness from the vegetables. I absolutely love the taste of properly ripen tomatoes and cucumbers, not to mention that you can buy them really cheaply when they are in season. Another old favourite of mine are radishes. Oh, mine, when I was a child I just loved eating them by themselves with just a pinch of salt, and they were amazing. I still love eating them this way, it’s the best snack you could ever get. For some reason, I find them a bit bitter without salt, not quite sure why. So, I guess it was an obvious choice for my salad. And then there is avocado. Enough said, you really have to try this salad! Or maybe I could tempt you with a light, “meaty” Apple and baked paprika chicken salad with dijon mustard dressing. And now, the best bit was left for the very end. 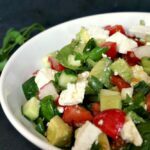 If you enjoyed my Cucumber tomato avocado feta salad, how about some more yummy summer salads to keep you nice and healthy? 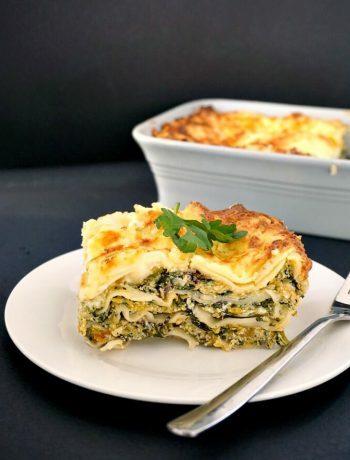 I have got these top 10 amazing recipes, I am sure you’d love all of them. Wanna give them a try? Hard to choose one, I know, so many try all of them? 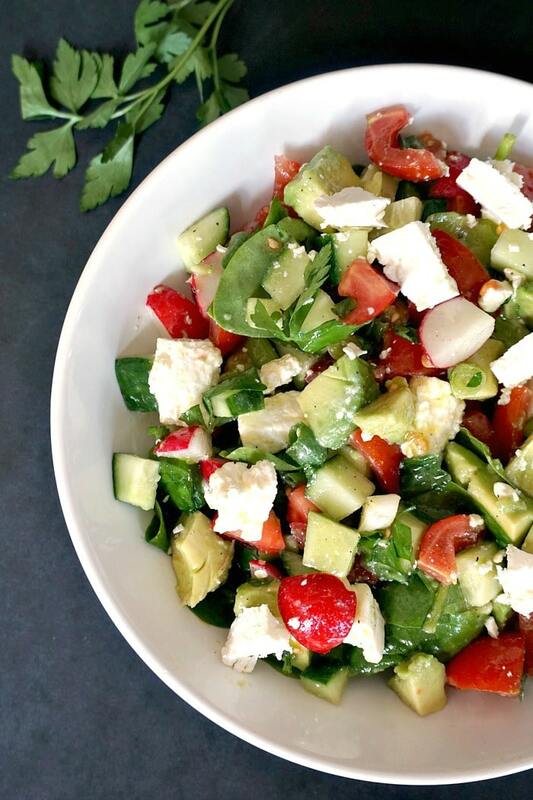 If you’ve liked my CUCUMBER TOMATO AVOCADO FETA SALAD or any other recipe on the blog then don’t forget to rate the recipe and let me know how you got on in the comments below, I love hearing from you! You can also FOLLOW ME on FACEBOOK, and PINTEREST to see more delicious food and what I’m getting up to. Cucumber tomato Avocado Feta Salad, a light, healthy and delicious recipe you can enjoy all summer long. The 2-ingredient dressing is simple, but so amazing. 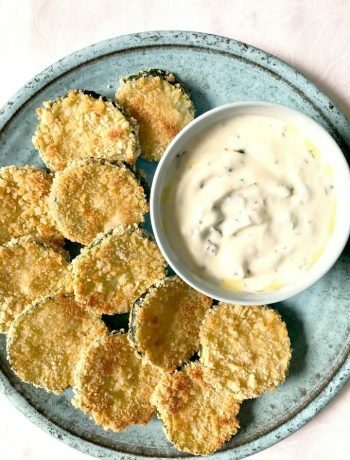 A recipe you really must try! Wash and cut the tomatoes, cucumber and radishes and add them to a large bowl. Remove the skin off the avocado, and cut it into cubes together with the feta cheese. Add them to the bowl. Finely chop the spring onions, and add them to the salad, mixing everythig well. Drizzle over the olive oil and vinegar, season with salt and pepper and mix to combine. Garnish with parsley. I have no tips on how to get toddler to eat. Mine is only 10 months and solids are still a struggle. Feta and avocado is a totally delicious combination! In fact I had it today for dinner! I love cucumber tomato salad with feta, but have never thought to add avocado. Yum! No tips on the toddler- my son ate well but my daughter was SO picky. 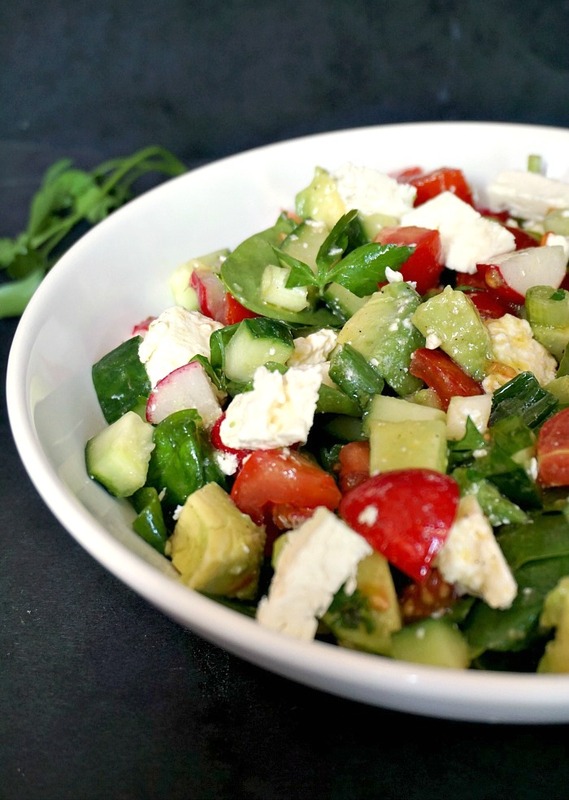 Love salads with avocado and feta! This one’s perfect for hot summer weather. Seems refreshing and delicious! You are welcome! Your salad is amazing! Summertime perfection! So light, yet super flavorful and full of good for you ingredients! Definitely whipping this one up soon! Your salad ingredients are just the type we love. The combination is so pretty and the tastes go so well together. The feta is just the finishing touch. Thank you! It’s so easy, but so delicious! This looks so good. I never thought to add feta OR avocado to my cucumber and tomato salads. Wonderful addition. I love the color of this salad. Hubby loves vegetables in general and also loves feta cheese so I bet he would be happy to have this on the table. What a lovely combination of flavors! My husband and I would BOTH love this. My kids, not so much, but they think mac n cheese is the epitome of gourmet, so what do they know? Ha l know, kids are ever so fussy! I don’t eat cheese but I could definitely find a Vegan version and make a salad. Thanks for the idea! Thank you! I am sure it would taste lovely without cheese too! A nice salad for summertime. It looks colourful and refreshing. Thanks for sharing the recipe. Great, I hope you will enjoy the recipe.